For the first time in 14 years, the first of two days of racing at NBX Gran Prix of Cyclocross featured UCI sanctioned Category 1 (C1) racing at Goddard Memorial State Park in West Warwick, R.I. Both elite races were the sixth of seven C1 races of the USA Cycling Pro Cyclocross Calendar (ProCX). And those same races were round seven of the eight-race Vittoria Northeast Cyclocross Series presented by Clif Bar and Cycle-Smart. A dry and seasonably mild day kept conditions fast on the root-strewn course, known for its legendary long beach run along Greenwich Bay. All the hype for the opening day of racing did not disappoint. With a commanding victory in the elite women’s race, Kaitlin Keough (Colorado Springs, Colo./Cannondale p/b Cyclocrossworld.com) earned a decisive victory. Her teammate, reigning U.S. Cyclocross National Champion Stephen Hyde (Easthampton, Mass./Cannondale p/b Cyclocrossworld.com), would return from a four-week hiatus from racing and claim an exciting victory for elite men. 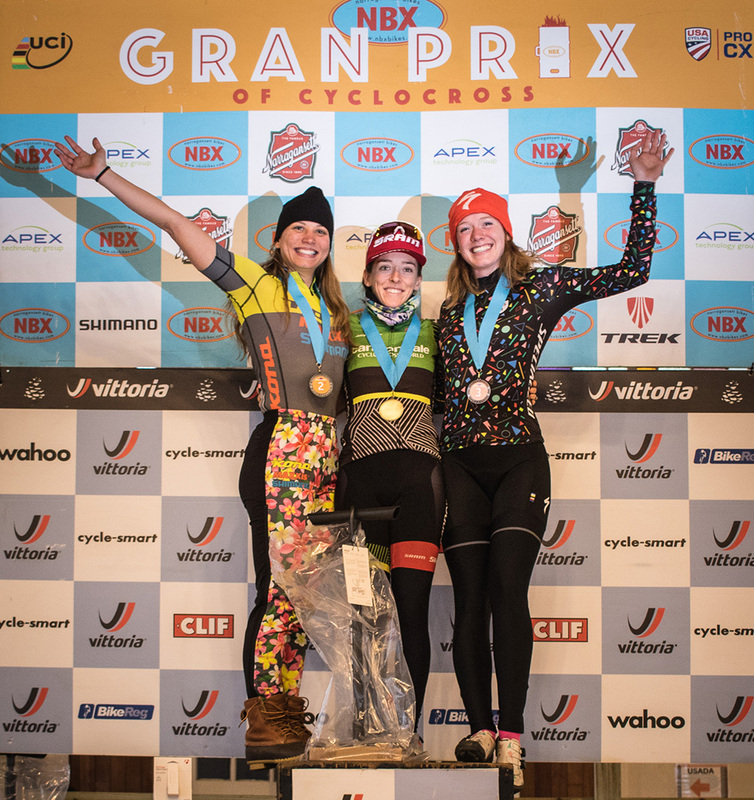 In the Vittoria Series, the longest standing, UCI cyclocross series in the United States, Saturday’s second-place finishers would extend their leads. Rebecca Fahringer (Kona Maxxis Shimano) would extend her Series lead for Elite Women with a total of 200 points. For the elite men, Curtis White (Cannondale p/b Cyclocrossworld.com) would clinch the Vittoria Series overall title for Elite Men with 350 points. A final Verge Sport jersey will be awarded to the winners Sunday. In the elite women’s race, Keough would lead the 40-rider field from start to finish. "I was going to try to be a little bit more conservative at the beginning just because I hadn’t raced these girls in a couple of weeks. I had a gap on that first lap and I just took off," said Keough, who has been racing in Europe. "I made a couple of little mistakes here and there, but that’s, for the most part, normal. This is my last race weekend before Nationals, so I was just trying to get a hard day in." Fahringer, who finished 36 seconds behind Keough in second place, was focused on having a smooth race on the tricky course at Goddard Memorial State Park. "The course always intimidates me. 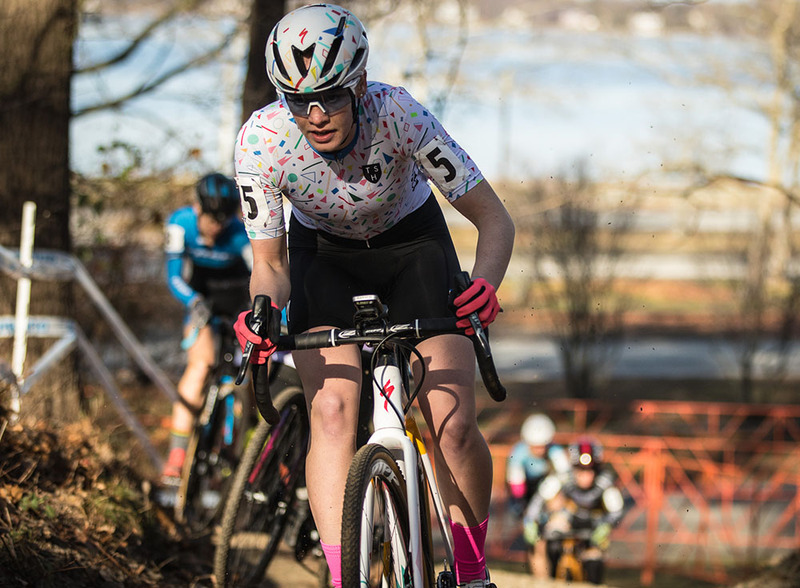 I knew if Kaitie (Keough) wasn’t having a good day, if I could keep the course at bay, that I might be able to battle for the win," said Fahringer, who is third overall in the ProCX standings. Keough is fifth overall. "I had a really bad start. So, I dealt with some traffic on the first lap and I found myself in second. I knew Kaitie was gone. She was riding smooth, she was so far up." Keough was gone after the first lap. Behind her, Fahringer held off Arley Kemmerer (Fearless Femme Racing) and last year’s winner Ruby West (Specialized-Tenspeed Hero). "It was a race for second place. And it was a race," Fahringer added. "Both Arley and Ruby, they were coming up from third, battling it out for third. I worked really, really hard and kept it together for second. I rode smooth, which is a rarity for me on this course. It’s always hard to keep it clean when you have people that are closing it in really closely. This is not a fun course to be hunted down on." West would finish 52 seconds off the winning pace by out-kicking Kemmerer to the line for third. The 19-year-old Canadian noted the fast, dry conditions and the talented field, all which made for a challenging race. "Kaitie (Keough) was here, so that also made it a super fast race. She just kind of got the holeshot and rode away from us right away. So I tried to stay with her for as long as possible because I knew she was the strongest one out there," said West, who had a breakthrough race at NBX last year winning the Saturday contest when it was still a C2 event. "You know, I think I found every single root in the park to hit on the first few laps. It took me a while to kind of get the lay of the land and figure out where I could NOT hit my rims. I thought I was closing on Rebecca, and I was trying really hard to get back to her, but then she accelerated and stayed away for second. Yeah, finished up with third and I’m pretty happy with that." For the elite men, similar to what we have seen all season, Cannondale p/b Cyclocrossworld.com took early control of the race with three riders in contention. The only difference today was the face at the front of Hyde. 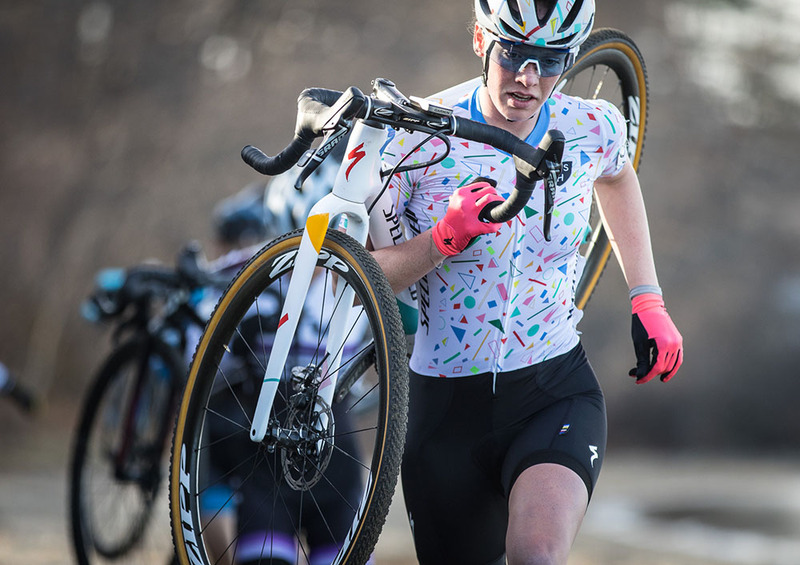 "Man, there was a lot of nervous energy for me today," said Hyde, who suffered a broken sternum at the Telenet UCI Cyclocross World Cup in Waterloo, Wisc. in September. "This is my first race back in four weeks, I think. And before that I did two race weekends, and it was six weeks off for the injury. You know, I’ve had a lot of anxiety about racing, and getting back to it. I was so excited today." Hyde would lead from the holeshot, setting a quick pace for the 52-rider field. "I knew I needed to lead on this race. There are some really heavy pedaling sections where you can draft, but there’s so many sections to make tiny mistakes. The sand, you always want to be first going into something like that. Yeah, I just wanted to ride at the front. I honestly had no idea where my fitness is at, because I haven’t been racing and everyone else has. And always puts a big question mark in your head." After three of the eight laps, teammates Hyde and White would distance themselves from two sets of chasers. Their teammate Spencer Petrov (Cannondale p/b cyclocrossworld.com) would battle ProCX points leader Kerry Werner (Kona Maxxis Shimano). A few seconds behind that duo was a contest between Jack Kisseberth (Garneau Easton p/b Transitions Life Care) and 18-year-old Sam Noel (UVM Cycling / Cannondale Cyclocross). "Curtis really pushed me hard. He pushed me very, very, very, very hard in the beginning and I needed that. He was my human scooter today," said Hyde about his teammate. "It is absolutely one of my favorite courses, not just in New England, but in the world. I mean, this is really one of my favorite courses. So I couldn’t be happier to take the win today." White would finish second, 8 seconds behind Hyde. In third place was Werner, 1 minute, 27 seconds behind the winner. Petrov would place fourth, Kisseberth fifth and Noel sixth. "He and I were feeling good, driving the pace early, taking pulls and just being smooth and sharp," said White. "I think the difference was (when) he started to stretch it out probably two and a half laps to go. I came back to him, tried to get in front of him before the sand pit, but he took back the lead. He just opened up the gap slowly. I think in working together we were able to figure out where each other was strongest. He was able to carry his speed really well through the technical sections. That forced me to accelerate just a little bit harder here and there, which added up over the course of the race." Werner would fend of 19-year-old Petrov, another Cannondale p/b Cyclocrossworld.com rider, in the final sprint to the line. "Stephen (Hyde) had a good start and I think he was looking to make things happen early," noted Werner. "So he and Curtis (White) took control of the front for the first two laps. I was struggling on these longer, power straights. So after two laps, those guys got away from me. I was riding by myself for a lap or two. Then Spencer Petrov came up, and we kind of started working together. I was thinking we can’t let a Cannondale podium happen. "Pre-riding the course, I kind of knew that coming out of pit two there was a big straight that paralleled the finish straight. I knew coming into the finish you wanted to be in the front. And I knew to do that you had to come out of pit two just smokin’. So I did that. Spencer actually came inside of me onto the final corner and had me by half a bike length or so. But I was able to get on top of it and hold him off." 20 Meghan Owens (USA) Hands-On Cycling p/b Guerciotti s.t. 4 Spencer Petrov (USA) Cannondale p/b Cyclocrossworld. s.t. 12 Dylan Mcnicholas (USA) POLARTEC s.t. 17 Samuel Kieffer (USA) Red Kite Fund s.t. 22 Andrew Borden (USA) Castleton University s.t. 24 Ben Frederick (USA) Independent s.t. 26 Daniel Vaughn (USA) JAM / NCC s.t. 30 Andrew Nicholas (USA) Independent s.t.